Frisco Dog Crate Replacement Pan is made to fit Frisco Heavy Duty Single and Double Door Crates, as well as most other standard-sized crates, this pan can easily replace your existing one—because while the pans included with the Frisco Heavy Duty crates are designed to withstand normal wear and tear, sometimes you’ll need a backup. It’s made with tough, durable plastic that’s designed to last, and it’s easily cleaned in the event your furry pal has an accident. Replacement pan fits all Frisco Heavy Duty dog crates as well as most standard-sized crates. Features a tough, durable plastic construction that is made to last. Quickly switches out with the flip of a latch for easy replacing and cleaning. Extends the life and safety of your dog’s crate. Gives your pet the stability and function they need in their pet home. 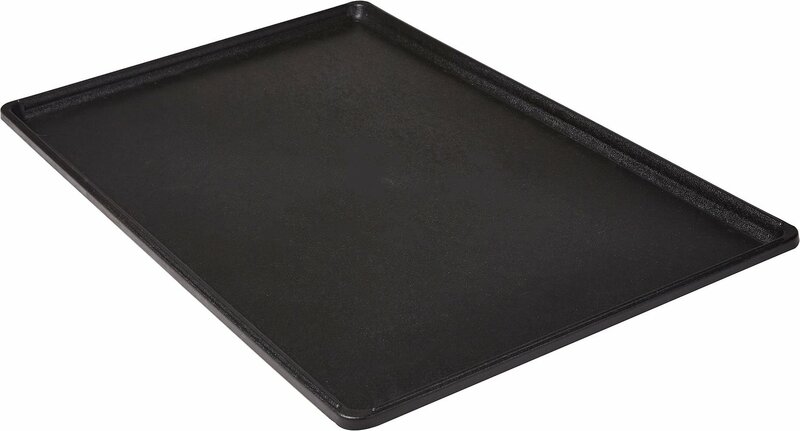 Note: This pan is specifically designed to fit Frisco Heavy Duty crates. It will work with other crates as well, but please measure carefully before ordering to ensure the perfect fit. Even the most playful pups need a spot where they can wind down and gather their energy for the next adventure. Frisco's created the perfect dens that are made to fit the tiniest pooches to the biggest member of the pack. These heavy-duty crates are designed for your pet's safety and comfort. With sizes that are slightly larger than the standard Frisco crates, these cozy lairs give your furry friends a place they can call their own. Keeping your pet safe is the most important feature of Frisco Heavy-Duty Crates. The sturdy wire panels are made with thicker and heavier wiring than the standard Frisco crates. As a safety precaution, the corners are rounded, and the wire is treated with a durable black electro-coating. Each door locks securely with a slide-bolt safety latch. The larger models have two latches per door for the ultimate protection. A dog's den should be his castle—a place where he can relax. Frisco Heavy-Duty Crates come with a plastic base pan to cover the wire floor and keep things clean. But you can also add a Frisco Crate Mat to make his den even more comfortable. These on-the-go beds are made from soft material with a cushioned bottom and thick bolster to make your pet feel at home in his den. It's easy to pack up into a compact, portable shape, so you can take the Heavy-Duty Crate along with you when you're traveling with your dog. Adjustable plastic handle(s) are included for transporting every size. They can be positioned in several spots along the crate to give you a steady grip. Frisco Heavy-Duty Crates not only come in multiple sizes, but they also grow with your pup as he gets older. The included divider panel can be inserted with minimal effort to create a smaller enclosure for puppies. You can move the panel to make the space inside larger until your pup reaches his adult size. This is my 2nd pan for our new kennel in about a month. The last one lasted a week before my dog checked and cracked it. The free one that chewy replaced it with lasted less than a week before my dog tore it up. I have it duct taped together now. My dog is 10 years old, about 65 lbs and a Pitt lab mix. Chewy customer service is like none other though. They are excellent. I would recommend chewy again. Although I measured my dogs crate and ordered the correct size, the pan was a bit too wide for the crate. My dog had it shredded into pieces within a couple of days. I thought that the heavy duty pan would stand up better to the wear and tear but it just didn’t last. I think if your dog is a moderate chewer it would be great. As for my dog, it never stood a chance. I needed a replacement pan for one of my crates and went to pet stores in the area but they didn't have the right size. I found this one on Chewy site when I was ordering some other supplies and it fits perfectly and is super sturdy and well made. Thanks Frisco and Chewy! I had ordered these from another company and the fit was way too small. So I returned them and ordered from chewy. Exactly what I needed. Although this was slightly larger than my crate - we easily trimmed one side to fit. Heavy duty! As always, Chewy has quick order processing. I have been looking for something to build my guinea pig cages. I have looked all over the web for something large and not super expensive. This heavy duty crate is GREAT. I actually bought 4 of them. They were the cheapest price on the net. Now it is easy to clean their cages. I also get all my guinea pig and rabbit food/litter/litter trays/treats and hay. Also get my dogs pills from them. THEY ARE GREAT. Thank you so much for making my life so much easier. It fits my older cage perfectly and feels stronger than the one that split. Half price from big box store. Delivery, as always was fast. Great product unfortunately it was slightly to big to fit my crate but I was able to give it to a family member for their dog crate. The plastic pan seems tough. It arrived when it was REALLY cold here in Chicago and had a 6" crack. That annoyed me but I taped the bottom and used it anyway so I wouldn't have to mess with a return. So far it hasn't broken more (about two weeks in). I purchased this pan to place under the new Frisco Deluxe Hooded Cat Litter Box with Scoop, Extra Large, 25-in. This really protects my floor. I purchased the 42 inch size.